With apologies to a Big Three brand, and at the risk of revealing my age: Have you driven a Hyundai lately? If your opinion of the Korean brand is based in the same decade when the commercials with that tagline aired, you really ought to give it another chance. Today’s Hyundais – and Kias, for that matter – have left the days of cheap and unreliable behind. I mean, they’re hardly paragons of luxury or completely free of flaws, but they were never intended to be those things. Rather, what they provide is an easy and approachable driving experience that’s packed to the brim with desirable features at an affordable price. It’s also, they say, a highly Korean trait to constantly review and reinvent, and that comes through in the facelift that’s been applied on the 2019 Hyundai Tucson. It wasn’t likely to induce heart palpitations before, and it’s still not likely to now. But it does employ some thoughtful updates, and an IIHS Top Safety Pick rating with the features at higher trims, which people shopping for a small SUV will appreciate. The most obvious update brought on by the refresh is what Hyundai calls its cascading grille. I haven’t loved its application everywhere – the worst part about the Kona is its front end, in my opinion – but on the Tucson, it really works. The designers have stayed away from the ultra-thin headlight style that accompanies this grille on the Kona and the new Santa Fe and have instead paired it here with a design that has more substance. This is more a side effect of legacy than anything, and updated lamps may yet come within a few years. Head around to the back and it’s a similar story: Hyundai is enjoying pushing things like giant reflectors and even turn signals further down the tailgate, the Kona’s nearly bumper-height signal being a prime example. The Tucson hasn’t fallen victim to this yet. It might down the line, but I find that where everything is sitting right now strikes just the right balance. LED headlights and taillights are standard equipment from the Sport trim up. The wheel designs have also been updated with 17-inch alloys being standard, 18-inch coming on at the SEL trim, and 19-inch being standard on Sport. In terms of dimensions, there’s so much variability in compact SUVs that it can seem overwhelming. If you put it on a spectrum, the Ford Escape is on the smaller end with a 178.1-inch length and 105.9-inch wheelbase, the new Toyota RAV4 is a little longer at 180.9 inches but has the same 105.9-inch wheelbase, and it goes up from there into larger two-rows like the Chevrolet Equinox and Ford Edge before pushing into two-plus-one row territory. The Tucson falls a little below the Escape, measuring at 176.4 inches of length and a 105.1-inch wheelbase, but somehow doesn’t come across as feeling quite as small. 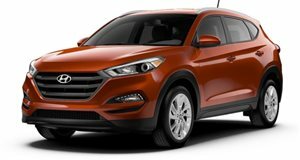 Hyundai has dropped the 1.6-liter turbocharged inline-four from the Tucson’s line-up with the refresh, replacing it with a 2.4-liter naturally aspirated four-cylinder that produces 181 hp and 175 lb-ft of torque from 4,000 rpm, matched with a six-speed automatic transmission. A smaller 2.0-liter engine is also available with the SE and Value trims that makes 161 hp and 150 lb-ft from 4,000 rpm. Sadly, one thing Hyundais still aren’t especially good at is going easy on fuel. The official EPA mileage estimates for this engine are 22 mpg city, 28 mpg highway, and 25 mpg combined with front-wheel drive, and 21/26/23 with all-wheel drive (which is equipped on this tester, and which is a $1,400 option on every trim level). Over my week with the Tucson – which, admittedly, was almost entirely city driving – I averaged a pretty dismal 16.4 mpg. It’s on the inside of the Tucson where most of the updates from the refresh have been focused. While the previous design was dark, dreary, and not especially ergonomic, this one feels lighter and more open and features a redesigned center stack that makes a world of difference in usability. The most important change – for someone of my build, at least – is that the infotainment screen has been pulled away from the dashboard and set standalone at the top of the center stack. Usually when designers do this, they set the screen back far enough that short-limbed people like me can no longer reach the buttons and dials on the screen’s right side. Not here, though – it’s mounted close enough to the seats that I can reach all of the controls without having to lean. (It’s like they’re listening.) Combine this with standard Apple CarPlay and Android Auto and SiriusXM that’s included from the Value trim with plenty of presets, some with a recording function, and the Hyundai infotainment system remains among my favorites. Another nice touch is the graphic that appears in the gauge cluster to tell you which setting the windshield wipers are on whenever they’re adjusted. This is a small thing, but when I don’t have it, I miss it. This tester is the top-of-the-line Ultimate trim, which comes with a stout list of included features: ventilated front seats, two-stage heated rear seats, the larger eight-inch touchscreen with navigation and 4.2-inch gauge cluster, rain-sensing wipers, and panoramic sunroof (which adds a lot of light to the cabin, but the switch that controls the window shade and the retracting glass panel is the same and is a little fiddly). Active cruise control with stop and go, forward collision assist with pedestrian detection, and high beam assist are featured at this level as well, but other manufacturers offer them at lower price points (Toyota, for example). Other features, several of which are new for 2019, are found on the Ultimate trim but come in at more affordable levels such as driver attention warning, lane keep assist, and forward collision avoidance assist (standard), heated front seats and side mirrors with an eight-way power driver’s seat, blind-spot collision warning, and rear cross-traffic collision warning (Value), second-row USB ports (SEL), a hands-free liftgate and wireless device charging (Sport), and a leather-wrapped and heated steering wheel and leather-wrapped shifting knob and surround-view monitor (Limited). Rearward storage remains a weak point for the Tucson. Its 31 cu. ft. of space behind the second row and 61.9 cu. ft. with the rear seats down – albeit with a 60-40 split and standard reclining seatbacks – is on the low side, even for the smaller end of this segment. But what’s more annoying in my books is the fact that the entire space is completely flat, which means there’s nowhere to tuck away things like, say, a spare bottle of washer fluid, or even just those loose little doodads that collect when you’re shuttling kids around, which means they end up rolling back and forth. The third rear seatbelt is still the ceiling-mounted kind, which means that it’s either buckled and in your rear-view mirror or it’s flopping around up above. There is an actual spare tire tucked away under the cargo floor as opposed to a patch kit, though, which isn’t a given these days. There’s a good amount of storage up front with deep cupholders available in the doors and the centered ones kept nicely out of the driver’s way. The center console isn’t massive but it’s relatively large for the segment, perhaps even giving enough room for an efficient packer to stuff in a very small handbag. This naturally aspirated 2.4-liter engine and six-speed gearbox combination doesn’t sound like anything special, but most people shopping in this segment will be very happy with how it comes together. It gets going well from a stop and stays surprisingly energetic, being nicely responsive with downshifts when they’re needed. I’d be happy with this one’s drive feel in daily use. Without having tested the smaller rental-spec 2.0-liter engine myself, I imagine I’d want to stay away from it. That shouldn’t be hard to do for most buyers, though, since the 2.4-liter becomes standard equipment from the just-over-$25,000 SEL trim. Handling isn’t exactly spritely, but it is flat, steady, and predictable, which is a very reasonable ask at this price point. Ride quality is perhaps a little on the rougher side, but not exceptionally so for the segment. Previous model years of Tucson in this generation allowed a fair amount of exterior noise into the cabin, particularly from underneath, but that’s been resolved to some extent. You may have seen news about the NHSTA opening an investigation into fire risk with certain Hyundai and Kia models. So far, the Tucson hasn’t been added to that list, though the two engines offered here are from the Theta II family, which is the one being looked into, so it may yet get looped in. However, the current list involves cars built in the United States, while the Tucson is still built overseas. Otherwise, the current generation does well in reliability surveys with only one recall for a minor electrical issue involving trailer brake lights. The Ultimate trim tested here, which is loaded to the nines as outlined above, has an MSRP of $31,550 plus destination charges, though the Hyundai USA website may apply additional incentives. The entry-level SE trim is priced at $23,200, while the Value trim is $24,650, SEL (where the 2.4-liter engine becomes standard) is $25,600, Sport is $27,700, and Limited is $28,900. Adding all-wheel drive to any trim costs $1,400, and delivery costs $1,045.